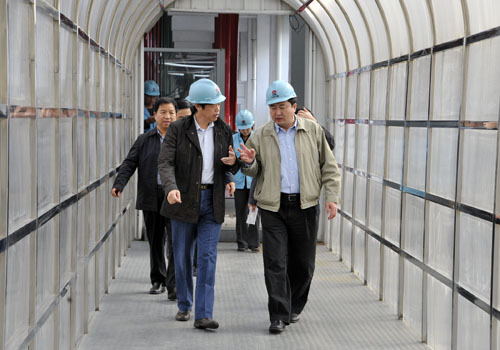 On October 23, 2012, Tian Baoguo, vice director of the National Ministry of Science and Technology, came to Tianguan Group to carry out field investigation of Tianguan�s mega-tonnage fiber ethanol plant and Chu Qingyi, director of the municipal science and technology bureau, accompanied him. Tian Baoguo and others inspected the production workshop of Zhenping Fiber Ethanol Company. The Group�s president and general manager Zhang Xiaoyang made a report that with respect to the key technology of fiber ethanol with full independent intellectual property right, we had independently built the nationally-largest mega-tonnage straw ethanol production unit and achieved stable operation by now and that all items of technology and economic indexes achieved nationally leading level and some indexes achieved internationally leading level. Director Tian Baoguo expressed appreciation to the achievements made by Tianguan in scientific research and innovation, urged the company to enhance research further and lay a solid foundation for improvement of the company�s core competence and development of the industrial scale.